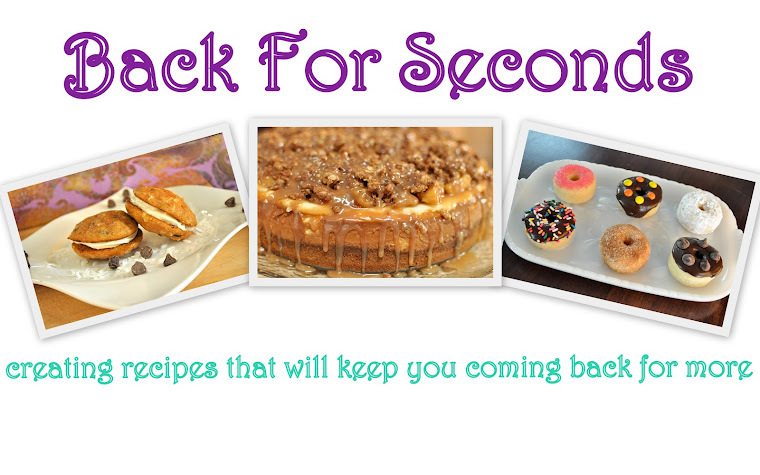 Have you linked up to the Back For Seconds Social yet? Click here to link up now! Everybody love s'mores, right? But we can all agree they're a big mess. I kind of hate getting messy. And sticky. Ew. 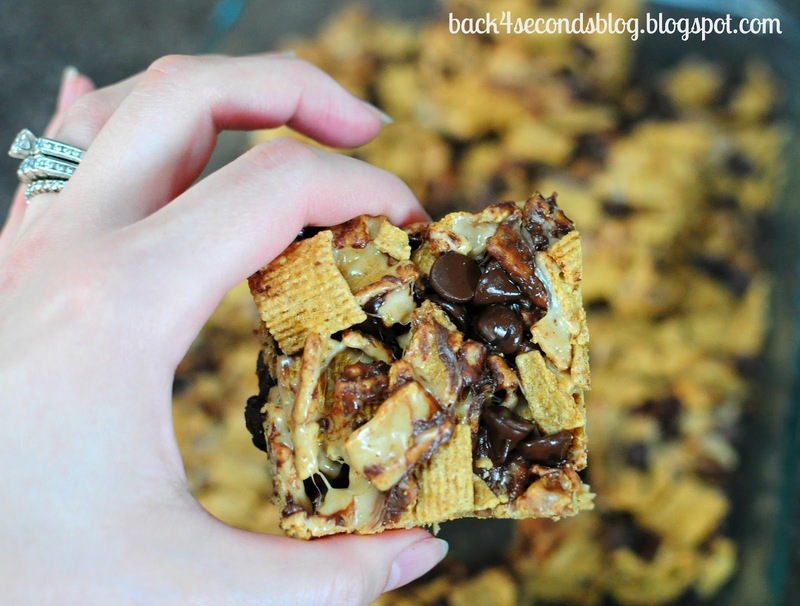 So I found a way to make these yummy treats less messy...and more delicious. Instead of graham crackers I used Golden Grahams cereal. It's perfect. Part of the chocolate chips get stirred into the mix while the marshmallow goodness is still hot, so they juuuuust start to melt. The generous scoop of peanut butter adds a creaminess that helps keep these bars gooey. Drool. Have I convinced you yet? Go make these! In a large pot melt the butter and peanut butter over medium heat. Stir in marshmallows and continue stirring until melted. Remove from heat and gently combine with cereal and 1 1/2 cups of the chocolate chips. Press gently into a greased 9x13" pan and sprinkle with remaining chocolate chips. When cool, cover and store at room temperature. Oh wow. You took golden grahams up a notch. Peanut butter? To. Die. For. And I'm all about the no mess. Outdoors? What's that? 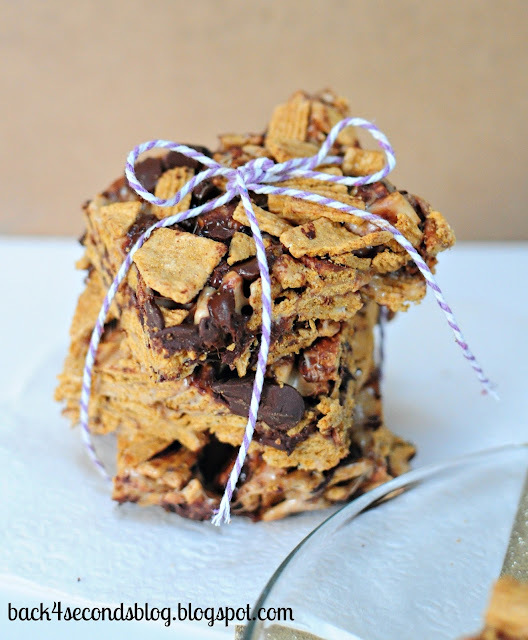 Golden Grahams... one of my favorite cereals and now, one of my favorite stars in s'mores bars! I LOVE pairing pb with s'mores... it cuts back some of the chocolate (sadly, I'm crazed and think there *can* be such a thing as too much chocolate) plus hello, fluffernutters?! Amazeballs. 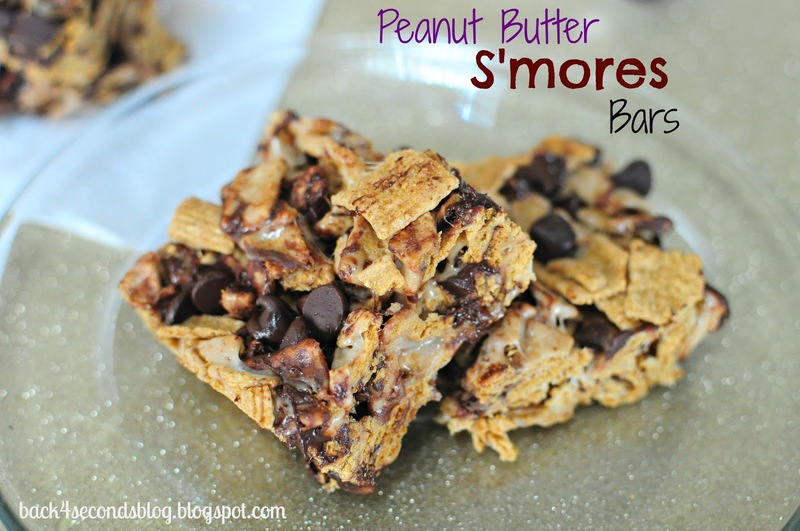 These look awesome and gooey without being too sticky... love! WOW! I can'e help myself...I'm drooling :) I love all things s'mores. Can't wait to give these a try. Here are some of my favorite s'mores recipes. S'mores Bars...http://inherchucks.com/2011/10/18/want-smore/ and S'mores Rice Krispy treats...http://inherchucks.com/2012/05/19/smores-rice-krispie-treats/. Thanks for sharing. Found you through Mom's test kitchen. Ya, these are awesome!! Found them on Creative Me. :) Have a great week! Amazing! Give me a fork and I'd be eating those right out of the pan! I love recipes that have a short ingredient list! =) And I LOVE Golden Grahams--why have I not thought of something like this before??? These look amazing!! Thanks for sharing this at Mom's Test Meal Mondays! Those look amazing! I LOVE smores! 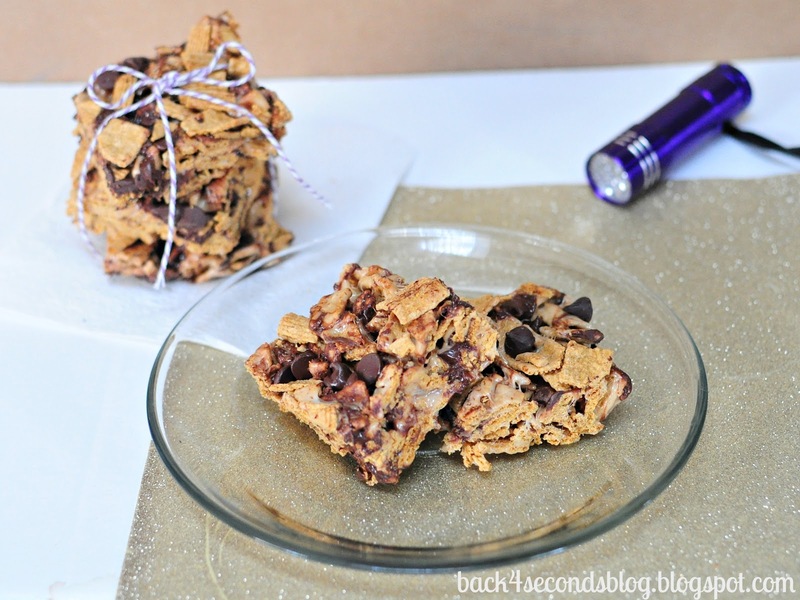 Thanks so much for linking up to the CHQ Blog Hop! Hope to see you again next week! Holy cow. These looks so. freaking. delicious. Now I need to make them - YUMMMM!!! Thank you SO much for sharing this recipe!! That is such a great idea, I hate the messiness of real smores LOL. Love your blog, new follower. :) I'd love to have you share this at my Show & Share Wednesday party! My girls are going to go nuts when I make these for them!Thanks for sharing, pinned! Yum! These look delish! I can't wait to try this recipe. Thanks for sharing at Creative Thursday this week. Wow these do look just yummy, I'm putting the recipe in my file. All of your recipes always look so yummy. This one however I'm going to have to share with my sister. She's a sucker for s'mores and chocolate/pb. She'll just flip over this. Hope you can pop over to the Labor Day Giveaway I'm having. Mmmm - looks delicious (and so easy!) Your newest follower. Thank you for sharing this! I actually made them and posted them on my blog here: http://www.bakeifyblog.com/peanut-butter-smores-bars/ Smores are some of my favorite things, I love having a different spin on them!! Thanks!! My kids would love these! Great to have you be a part of Seasonal Sundays. Looking forward to having you with me this Sunday. Oh these loos so good! Hope you are having a great weekend.